The airport of Gosselies is located not far from the town Charleroi and is without a doubt one of the major sites regarding Belgian aeronautical industry. Thanks to this industry this little interwar airfield grew bigger and bigger throughout the years and the 50's and 60's were full of events and developments with the emergence of mythical airplanes such as the F-104G. During the years 2000 air transport developed from and towards Gosselies and regarding this aeronautical wealth, it seems appropriate to draw a special page together with our “Archivalia” pages to present you a panel of events, which happens and/or happened at this airport, some forgotten others not ever mentioned. The page 'Echo Bravo Charlie India' will consist of two parts, one covering the 20th century including big and small events untill the eve of the year 2000. The second page covers the 21th century and our goal is to complete these pages, bit by bit, with old images or with recent visitors. This new column was made possible through our contributors Pierre Taquet and Philippe Decock as well as through our SBAP-archives and other contributors. We are sure other contributors will also be read as findings gradually will show up regarding, what is called since some years, 'Charleroi - Brussels South Airport'. With the emergence of the modern aerostation and following the royal experience of the Champ de Mars on August 17, 1783, the military engineering rapidly took an interest in this new technique of aerial observation. The plateau of Gosselies, called the 'Mont des Bergers' and which dominated the region, was home to ascent tests during the batlle of Fleurus as the terrain was close to the headquarters of General Jourdan. Due to its geographical location Gosselies had to have an aeronautical vocation as the plateau was culminating the whole region. 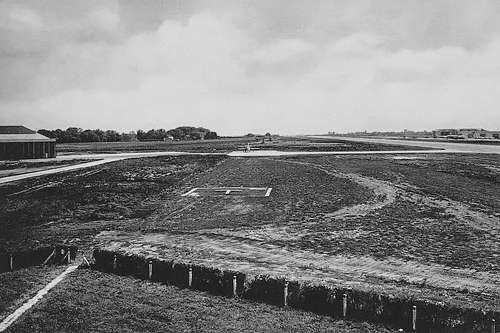 Some months after the end of World War I, the airfield, inaugurated in 1919 by his majesty King Albert, became home of the first Belgian flying school training around 400 military and civilian pilots. In 1920, Commandant Fernand JACQUET, a Belgian World War I ace, founded the Société Générale d'Aéronautique (SEGA) at Gosselies, comprising mainly the maintenance and repair of the flying machines used by the numerous flying-clubs in the area. Developments went well ahead and confidence in aviation future builded up and the SEGA-company acquired allotment by allotment managing to gather some 28 hectares in one batch. In the 20's the main activity of Gosselies airfield consisted of flight training and 'leisure' flights and from 1926 on we could see the upcome of repair and maintenance of various aircraft types. On August 27, 1931, the bylaws of the company Avions Fairey S.A. were signed and published on September 12, 1931 in the appendix of the Moniteur Belge. This company would alter quite profoundly and long-lastingly the scenery of the Belgian aeronautical industry. The capital of the Avions Fairey S.A. was allocated through the parent company Fairey (Hayes), Richard Fairey and Oscar Tips, SEGA and four other founders. The management of the company was entrusted to Mr Tips who appointed Fernand Jacquet as the commercial director. I no time Gosselies became the capital of the Belgian aeronautical industry. On May 10, 1940, 05.00 AM, the German air force attacked Gosselies airfield and the Luftwaffe bombed and destroyed completely the hangars and facilities of the Fairey Company which was license-building Hawker Hurricanes at the time. 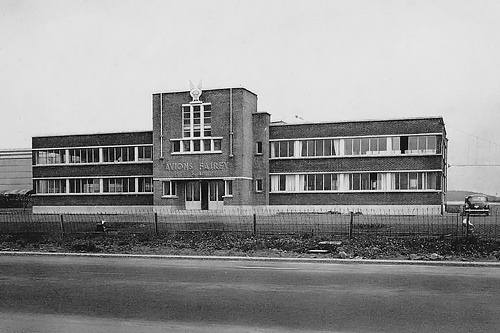 In 1940 Gosselies was the only Luftwaffe airbase in the region, not with an overflow on activities although the German administration found it convenient to conceal its installations into civilian dwellings as it did for most of its operational airbases. A "Bergungskommando", Fulgberk 10B was stationed on the premises to investigate any location where an allied aircraft was shot down, to identify and recover interesting parts and sent the remains back to Germany to be recasted. Guarding of the airfield was not regarded as that important although a unit of the “Vlaamse Wacht” reinforced the personnel in 1943. At the end of 1942 the Luftwaffe rebuild an airbase at Florennes, becoming operational in 1943 to welcome Stab/NCJ4. From that time on Gosselies became a diversion airfield where some German aircraft were permanently based. On April 1944, two fighters took part in one of the sole aerial combats in the area against American planes : the first was shot down ; the second, damaged, landed back at Gosselies to utlimately be destroyed on April 23 during a ground attack by an American fighter. "... A concrete road, 10 meters large, running from the North to the South. The perimeter was converted to agricultural land for the Luftwaffe. Oxes and tractors are used together with about fifty labourers and cows and sheeps graze within the enclosure. The airfield is not permanently in use and the airplanes present are a light bomber and a two-seat fighter aircraft. Regularly a JU52 transport aircraft comes in to land and departs back after a few hours. If the stay is to be extended, the hangar is guarded by a sentinel... Although the airfield is lightly guarded, the sentinel keeps some big dogs, shepherds like. The enclosure of the airfield consists in a simple mesh tautened between concrete posts. No Flak present and the platforms are unoccupied. The flight area is completely unobstructed and the airfield has no “frisian horses” on site. Dimensions are still 1 km by 1 km with three hangars, 38 meters large, with 8 sliding doors (4 meters width). These hangars are made of sheet metal and the sides are protected by brick walls of 50 cm thick and 6 meters high. With the liberation occuring in September 1944, the airfield enters an American period and becomes Charleroi A-87. From September 11 on, two photographic reconnaissance aircraft are based on the premises and till the end of the operations, Gosselies stayed a transit center for medium bombers flying from England towards Germany. During the liberation period, the airfield is frequently visited by civilians and the authorities had to take some decisions prohibiting traffic onto the surroundings of Gosselies airfield as the use by the American military aviation made this traffic hazardous. During several years a 'crossing keeper' protected the crossing of the runway at the road from Jumet to Ransart. From June 1945 on, Fairey Aviation Company decided on the continuity of the company at Gosselies and started to rebuild the ruins left over by the Germans. The passage of seven Douglas C-47A Dakota through the Fairey workshops marked the reboot of the company. 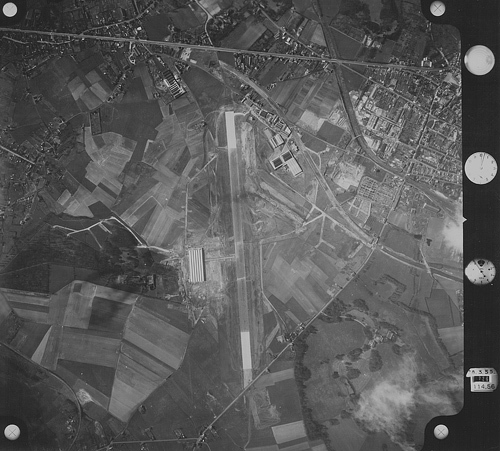 On November 20, 1946, Gosselies is classified in the public airfield category and its exploitation ensured by the Régie des Voies Aériennes (R.V.A.) from 1947 on. Thanks to new contracts the Fairey Aviation Company booms and the workshop area is doubled in just one year. On July 27, 1954, Fairey S.A. and SABCA temporarly teamed up with the Ministry of Defence within the frame of the Hawker Hunter program. At this occasion the Société Anonyme Belge de Constructions Aéronautiques (SABCA), located at Haren near Brussels, decided to install a new factory at Gosselies. The Régie des Voies Aériennes, owner of the Gosselies airport, built the hangars with an area of 12.800 m2, parallel to the runway and the route des Fusillés, nowadays a private road giving only access to the SABCA facilities. This road was named that way to commemorate the slaughter of 241 people by the German soldiers between 1940 and 1945. A monument was also erected in their memory. The war damages allowed the rebuild of a new south-east runway with a length of 1.400 meters which was inaugurated on July 13, 1953 during the Exposition Technique de la ville de Charleroi (Technical Exhibition of the town of Charleroi). In 1955 the Régie des Voies Aériennes decided to lengthen the runway to 2.550 meters. The “Golden Sixties” favoured the development of fast communication means such as the “autoroute de Wallonie” and the fast axis Antwerp-Brussels-Charleroi (A54). The creation of industrial areas between Mons and Namur reinforced the privileged geographical location of Gosselies further more. 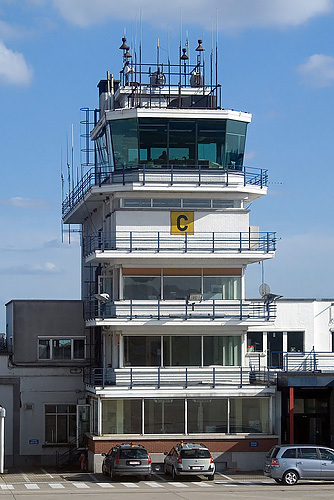 A control tower was constructed in 1960 together with a passenger terminal and a fire department, especially trained for air crashes with dedicated equipment. 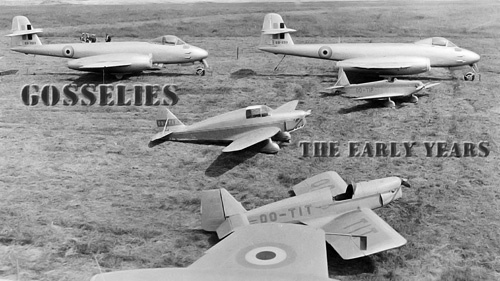 During a transition period from the end of 1957 till the end of 1960, the main activities of Fairey S.A. consisted essentially in I.R.A.N. contracts for the Belgian Air Force and the French Armée de l'Air. In 1960 SABCA was chosen by the Belgian army, in a momentary partnership with Fairey, to build the F-104G Starfighter with the first flight of this aircraft at Gosselies on December 04, 1961. SABCA was to produce the F-104G for the German Federal Republic, Belgium, the Netherlands and Italy. 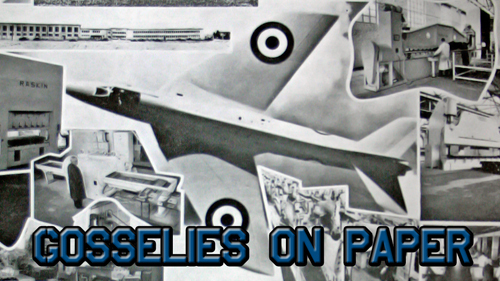 As to maintain the workload, Fairey had to diversify its production and turned towards subcontracts such as the 'Alouettes' of Aérospatiale. On August 22, 1963, S.A. Avions Faitey becomes Fairey S.A. to affirm its competitive mainstay within the world of modern techniques. 1968 sees the Belgian government deciding to acquire Dassault Mirage V aircraft to replace its F-84F and RF-84F, already assembled and test flown by SABCA at Gosselies. 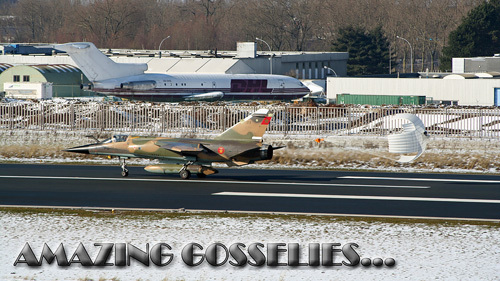 That same year Dassault Aviation built an assembling factory at Gosselies which became operational in November. 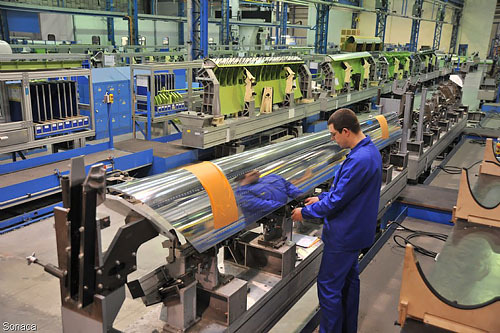 The company AMD/BA (Aviation Marcel Dassault / Breguet Aviation) took a share of 50% into the SABCA fundings (45% Fokker-VFW, 5% public) and created a new production line on the Gosselies site. Together with the R.V.A., the Société pour la Promotion de l'Aérodrome de Charleroi-Gosselies (SPAC) started from 1965 on a series of actions as to endue the airport, in the medium term, with the minimum required equipment for the development of passenger transport and cargo (radar, beacons, customs, reception hall,...). Besides transport, the expansion of business aviation and general aviation is also contemplated. Two general aviation manufacturers settled down at Gosselies: SIAI MARCHETTI (DELHAMENDE) and PIPER. At the start of 1968, the R.V.A. provided a new company building available for general use together with a new hangar which was due to be completed and on May 01, 1975 a new terminal capable of handling up to 400 passengers is opened. After a period of almost total dependence on military programs, Fairey S.A. regained the construction of civilian aircraft - manufacturing and assembly of the 'Islander 2, the “Trislander” and the 'Defender'. However, from 1976 on, Fairey starts to have difficulties with the marketing and sales of its aircraft. On June 07, 1975, after 5 years of controversy, Belgium decided to acquire 116 General Dynamics F-16 to replace its Lockheed F-104G. SABCA ensured the manufacturing and final assembly of 174 Belgian and Danish aircraft of which the first example, FB01, was delivered on June 09, 1978 aboard a Lockheed C-5A Galaxy of the USAF. The inaugural flight took place on December 19, 1978 with official delivery to the Air Force on January 26, 1979. Jointly with the F-16 program, SABCA ensured the production of 32 Alpha-Jet for the Belgian Air Force, the first one being delivered with great discretion on December 14, 1978, staying into the shadow of the new fighter. The YF-16 had been withheld by the Belgian authorities to replace the F-104G Starfighter. The economical offspring for the Belgian aeronautical industry was huge as the Belgian companies not only would produce parts for the aircarft of the Belgian Air Force but also for those of other European countries (Denmark, the Netherlands and Norway) and some support for US aircraft. SABCA and Fairey were to manufacture the sub-assemblies of the fuselage, the wings and the flaps of the European aircraft. For Belgium this offspring represented 58% of the engaged expenses. 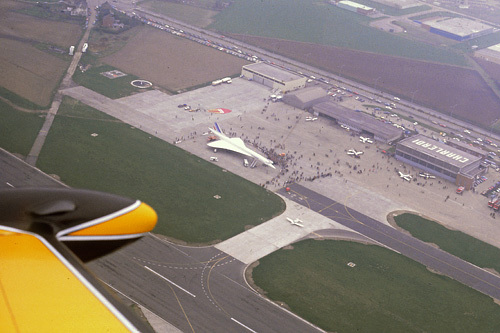 On May 03, 1976, on instigation of the “Ministre-Secrétaire d’Etat à l’Economie Régionale Wallonne” Jean Gol, the town of Liège and Charleroi were daily connected to London-Heathrow through one flight (departing at Publi-Air, sub-contractor for Sabena). Financially hazardous, but feasable. After one year of running, the initial budget had by far been exceeded and the obtained results stayed disappointing regarding the number of carried passengers. In January 1978, following several restructurations, the line Charleroi-London was increased to two flights a day, but the number of passengers did not change significally and a stop-over at Ostend was introduced in July 1978. On July 14, 1976, Fairey S.A. signed a contract with General Dynamics covering a total amount of 3, 8 billion Belgian francs. 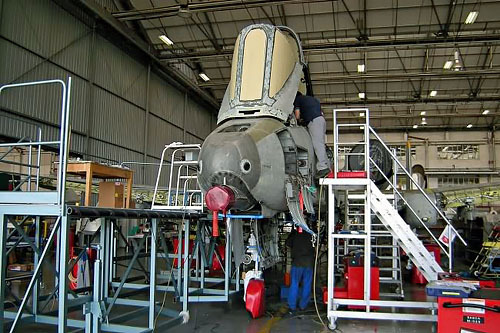 The scale of this contract compelled Fairey to invest 70 million in new facilities and 285 millions in technical equipment and resettlement of workshops. These amounts were subsidised by the Belgian government. During the first semester of 1977 the fincancial situation of the Groupe Fairey declined rapidly and the stock-listings of Fairey were suspended at the London stock-exchange. Fairey Company Ltd could not respond any more to the financial burdens of its Belgian branch towards its creditors and mainly of the Office National de Sécurité Sociale (ONSS - National Social Security Office). Together with political and syndical agencies, the Ministry of Economic Affairs and the Regional Wallon Economy, the liquidators and the direction of Fairey Gosselies managed to create a company with mixed capitals to take over all the current contracts. SONACA is a fact on May 01, 1978 under the leadership of Marcel CLAISSE, newly appointed managing director. The investments started in 1979 and unceasingly pursued finally yielded results. A terminal building (departures-arrivals) with an area of 840 m2 was put into service in 1984, comprising a public zone, a transit zone and an arrival zone, all fitted with service rooms. In 1985 SABCA was awarded a contract for the overhaul of the European based Cruise missiles. Named European Repair Facility (ERF), the missiles were treated in the high security hangars of SABCA, built or converted on a radar-detection protected site, in the most discrete way... The contract was worth some 220 million Belgian francs. The airport of Charleroi-Brussels South entered a new era on January 01, 1992 when this year saw the achievement of the institutional changes decided by law of August 08, 1988, which devolved competences in transport matters to the Regions. Within the frame of the restructuration of certain public organisms, the Région Wallonne integrated into its missions the previous competences of the Régie des Voies Aériennes. These missions are mainly technical: build, convert, maintain and operate airports, airfields and their facilities. This law coordinated by the Royal Decree of March 13, 1991, art. 27, establishes the transfer of goods, rights and obligations of the Régie des Voies Aériennes to the Région Wallonne. The cooperation agreement of November 30, 1989 signed with the Belgian State governs the dispositions to be taken as to give them the means to exercise their competences entrusted by the institutional reforms of the State. The Royal Decree of August 05, 1992 transfers the goods, rights and obligations from the Régie to the Région Wallonne. 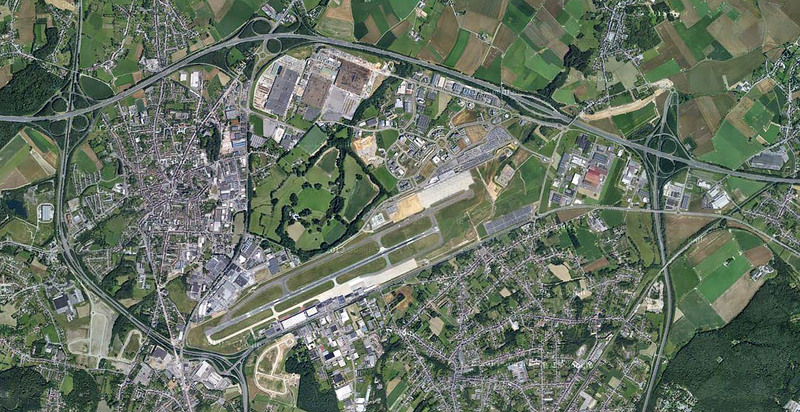 On July 07, 1991 a concession agreement was signed between the Région Wallonne and the S.A. (société anonyme) Brussels South Charleroi Airport. Since the regionalization, the infrastructural investments done by the Région Wallonne clearly showed the dynamical regional and voluntaristic will to develop its airports. Ultimately during 1998, the R.V.A. was dissociated into two services. The first one renamed BIAC ensures the management of the airport of Zaventem (Brussels National Airport) whereas the second one, BELGOCONTROL, ensures the technical exploitation formerly allotted to the R.V.A. including the regional airports. 2. The management company B.S.C.A. Sa. - the coordination of the various public and/or private actors directly or indirectly implicated in the airport activities of Charleroi - Brussels South. The Walloon airports having been conceded to a third party, the direction of the airport is organized in one department which ensures all the non-conceded tasks and mainly those regarding the airport inspection, navigation office and airport security. 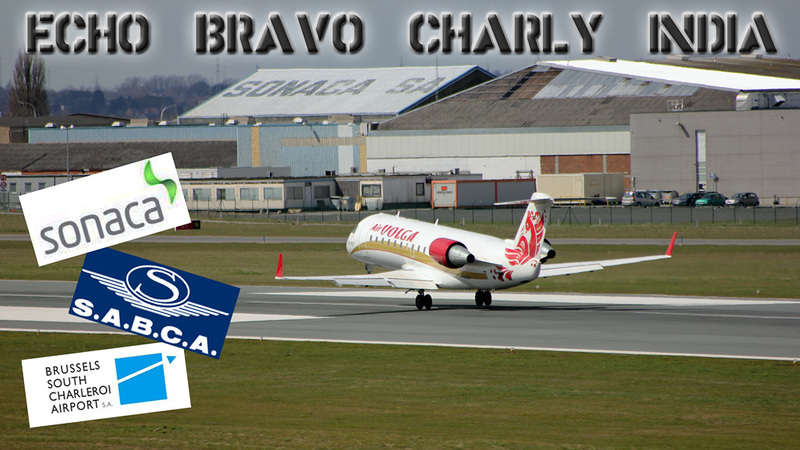 The Walloon government, during its session of June 06, 1991, decided to grant a department concession to Brussels South Charleroi Airport Sa (B.S.C.A. Sa.) 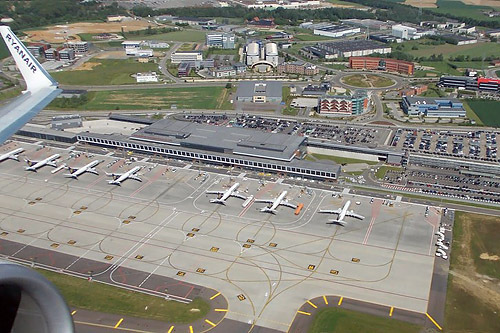 regarding the promotion and management of the public domain of the airport of Charleroi, as well as a national concession for the permanent and exclusive use of this airport zone. On July 07, 1991, a concession agreement was signed between the Région Wallonne and B.S.C.A. Sa., this latter being responsible for the management of the airport at Charleroi. This agreement determines the part of the manager and instructs the Walloon Ministry of Equipment and Transport (M.E.T.) to monitor the compliance to this agreement. Due to the nature of this public service concession, it is up to the conceding authority to monitor the compliance of the missions conceded to B.S.C.A. Sa. The concession is a delegation and not a resignation of services, so the authority must, at all times, be able to assess this compliance. The D324 has also to establish inspection reports regarding the good implementation by the contractor of the maintenance of the infrastructures and the functionality of its fire department. An evaluation report is made up annually based on these inspection reports. The contractor will ensure the maintenance of the surroundings, buildings, equipment, works and materials included in the concession or made available to him, in such way it always corresponds to the use it has been destined to. Ryanair flies from Brussels South Charleroi to Dublin. First legitimization of the new name. Succes garanteed as the airport recorded 200.000 passengers/year. Traffic on BSCA represents 15% of the traffic at Brussels National, against 1% in 2000. The number of passengers reaches 2.166.915. Arrival of Private Wings and launch of the line to Ingolstadt on November 01. Installation of an ILS (Instrument Landing System) Category III. This ILS allows aerial operations in very low visiblity conditions. In other words, aircraft can land and take-off in less than favourable meteorological conditions. Long-time partner of the USAF, the company based at Gosselies assembled some 330 F-16A and C for his American customer since 1983. In 2001 he company was awarded a contract, in cooperation with the Ogden Air Logistic Center (OO-ALC) to integrate the NVIS-IDM program into the F-16C & D and Block 40. In March 2005 another contract was signed with the American government, to know, the fulfilment of the 'Depot Level' maintenances of the complete F-16 fleet of the USAFE. In Februray 2000 a contract was signed for the inspections, repairs, updates and paint of the A-10 Thunderbolt II fleet based in Europe. The professionalism of the Belgian manpower, much to the satisfaction of the customer, made that the contract was reconducted for another 5 years in 2009. But the decision of the American authorities to withdraw its tankbuster from Europe changed the issue for the Belgian industry with a significant decrease of the workload. End 2008 and during 2009, flight testing opened possibilities to carry and fire new equipment’s with the Mirage F1. These tests were conducted aboard Mirage F1CR n° 602, under the mastery of Dassault Aviation. The Belgian company SABCA was awarded the implementation of the systems onto two modified Moroccan aircraft prototypes; the first one had its inaugural flight in October 2009 from the airport Charleroi-Gosselies and the second prototype flew in February 2010. Once the navigational tests completed in Belgium, the aircraft departed to Morocco for their operational test phase. At last do take note of the fact that the Belgian aeronautical companies based at Gosselies are important participants in running projects such as the Airbus A350 or the A400M, which one day will proudly fly in our Belgian colours. The companies are also involved in spatial industry, as much on the satellite-level as on the launchers level such as the Ariane rocket. As we can see, the little airfield of Charleroi-Gosselies became an important cluster into the Belgian aeronautical scenery. Development of passenger transport and the adroitness of the aeronuatical industries are the key-stones and although the future will not always be bright, the Belgian aeronautical willingness is still present.